Well I finally got a Google+ Invite but I don’t have any of my friend or family as member of Google+ which makes the point of sharing and social networking pointless. As the invite is on trial basis and will slowly and randomly expanded by opening up to more and more people. But once you get an invite and had created an account you can definitely add more people in your circle, but the process is not simple and requires to dig a bit deep and needs more than few clicks. Here is what I have learned, I don’t guarantee that this is the only or correct method but I think this process of adding friend will get you going on the way to connect and form circles and hangouts. You will reach a page as shown below, since I am using Gmail account all my contact show by default, however you can also add friends from your yahoo or Hotmail account. BTW, it also possible send invite by simply double clicking on the name on the previous page, but it is suggested that you add the people in circle and then send them invite, this is the only way which has worked for me. One point which came to my mind while registering for Google+ was that as most of my friends are on FB then why G+, well before FB become popular in India it was Orkut all the way, but FB overtook it in India may be Google want to strike back to FB with G+. But one thing is sure whichever offers better service, uptime and easiness of usage will be winner. 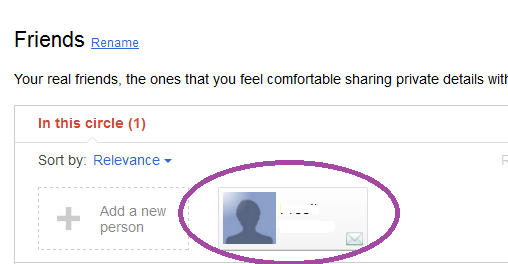 So best of luck on getting Google+ invite and inviting others. Today 02nd July 2011 is a very important day in my life. Nothing out of ordinary happened and no none of my family or friend have their birthday, anniversary, etc. today, nor do any other special event happened today around me but the day is still special. Today, my One & half year daughter travelled with me in the car solo. Yes, many kids starts understanding the things by this age and they also travel solo in car with seatbelts on but again its my blog and my expressions. The drive of 2 kilometres from nearby bus stand to my home was travelled at a blazing fast speed of 15 – 25 km/hr. in 1st and 2nd gear. Being my daughter so naughty, I had no option of putting her on backseat where her last adventure of solo sitting resulted her in falling with face into the seat and she somehow couldn’t roll back to bring her face upside. The previous experience prompted me to put her front seat and put the safety belt on, from where she wrangled out her way in couple of minutes, with on moving traffic and honking horns I didn’t had option to again make her sit so I just somehow make her stand on the seat and drove back. It was a real experience for my daughter where she travelled without anyone holding her in lap. The experience of initial crying of being stranded soon become laughter of joy when standing on the seat and peeping out by pressing her face against the window glass. Anyway this experience gave me confidence that my daughter slowly but surely getting ready to become more independent on these small but important things and she is learning the important lessons of her life. This riding solo experience is one which I really feel that I will cherish for a long time.